From the Nerima IC of the Kanetsu Expressway in the north western area of Tokyo, head north until Yuzawa IC. Yuzawa IC is just a few kilometres away from the centre of Yuzawa Town and the main train station. 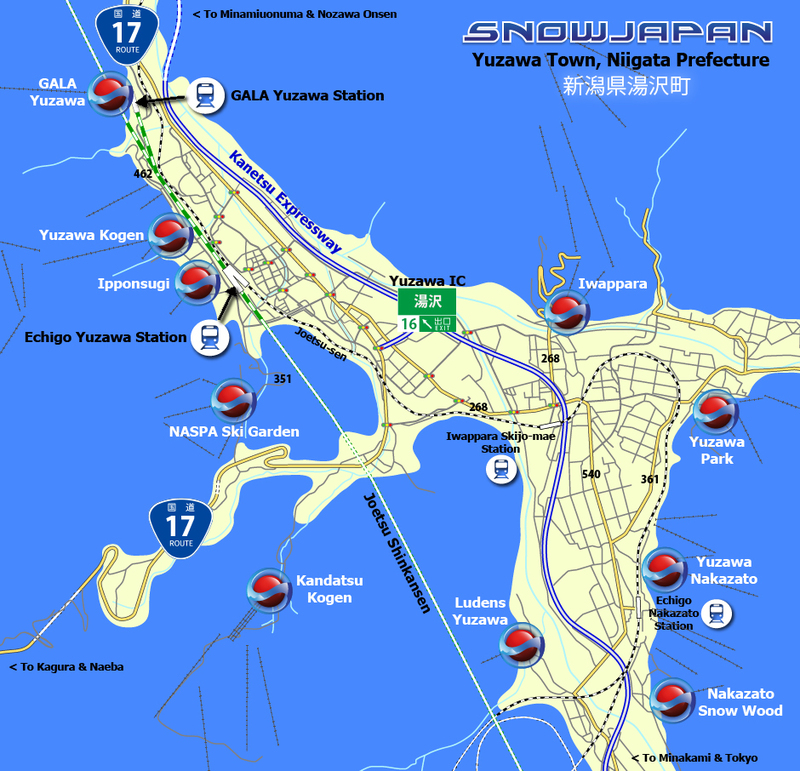 Most of the ski and snowboard resorts in Yuzawa town and Minamiuonuma city are within a 10 minutes drive from either the Yuzawa IC or the next exits on the Kanetsu Expressway, Shiozawa Ishiuchi IC and Muikamachi IC. Some people heading towards the Naeba resort - and perhaps the Tashiro Ropeway Station of the Kagura resort - choose to exit the Kanetsu Expressway before Yuzawa at the Tsukiyono IC which is in Gunma Prefecture. From Tsukiyono IC it is a 31km drive north up to Naeba using Route 17. There are lots of curves on this section of Route 17, and sometimes wild monkeys can be seen at the side of the road. One feature of the Kanetsu Expressway through to Yuzawa is the 11+km long Kanetsu Tunnel (the longest mountain range tunnel in Japan) which goes under the Tanigawadake mountain range and connects Niigata Prefecture with Gunma Prefecture. The Kanetsu Expressway is famous (perhaps sometimes infamous) for being extremely congested at certain peak times, for example on a Sunday afternoon and evening in peak season, and during snow storms. Best to keep this in mind! The Yuzawa region is very easy to get to from the Niigata City area - just head south on the Hokuriku Expressway and then change to the Kanetsu Expressway at Nagaoka JCT and continue south. From further afield, Yuzawa is also a smooth drive from Fukui, Ishikawa and Toyama. Head towards Niigata City using the Hokuriku Expressway, and change to the Kanetsu Expressway at Nagaoka JCT. 神立高原 about 1.3km Turn left onto Route 17, through some traffic lights going past the 7-11 convenience store. The entrance to Kandatsu Kogen resort is signposted soon after on the left hand side. The car park and resort base is a another 1km or so along a narrow approach road. NASPAスキーガーデン about 2.5km Turn right onto Route 17 and go straight ahead for about 650m to the second set of traffic lights. Turn left at these traffic lights and go straight on this road for about 800m, passing Yuzawa Town Office on the left hand side. Go under the Shinkansen train line and at the t-junction turn left onto Prefecture Road 351 which goes past the clearly signposted NASPA Ski Garden. 湯沢高原 about 2.5km Turn right onto Route 17 and go straight ahead for about 650m to the second set of traffic lights. Turn left at these traffic lights and go straight on this road for about 800m, passing Yuzawa Town Office on the left hand side. Go under the Shinkansen train line and at the t-junction turn right to head into Yuzawa. Yuzawa Kogen (the Yuzawa Kogen Ropeway Station) is about 1km on the left hand side, about 650m past the West Exit of Echigo Yuzawa Station. 岩原 about 3km Turn left onto Route 17 and go about 600m to the traffic lights at the 7-11 convenience store. Turn left at the traffic lights and continue for about 650m until you reach another set of traffic lights by a Save On convenience store. Turn right at these traffic lights and continue for 850m - through one set of traffic lights until you arrive at the second set of traffic lights. At this junction there are signs for Iwappara. Turn left here and head towards the resort which is around 800m from the traffic lights. 湯沢パーク about 4km Turn left onto Route 17 and go about 600m to the traffic lights at the 7-11 convenience store. Turn left at the traffic lights and continue for about 650m until you reach another set of traffic lights by a Save On convenience store. Turn right at these traffic lights and continue straight on for about 1km through two sets of traffic lights. After going under the Expressway bridge and then the local train line bridge, take the immediate left left to head towards Yuzawa Park. The resort is about 1.5km further down that road on the right hand side. GALA湯沢 about 4km Turn right onto Route 17 and continue towards Minamiuonuma for 3.4km after which there is a large sign on the left hand side. Turn left at the sign and follow the road for about 700m to the car parks at GALA Yuzawa. 湯沢中里 about 4.5km Turn left onto Route 17 and go about 600m to the traffic lights at the 7-11 convenience store. Turn left at the traffic lights and continue for about 650m until you reach another set of traffic lights by a Save On convenience store. Turn right at these traffic lights and continue straight on this road for about 1km through two sets of traffic lights. After going under the Expressway bridge and then the local train line bridge, the road quickly bends to the right - keep on this road. About 1.5km further on there are signs for Yuzawa Nakazato - follow the signs by turning left and then soon right again, and go under the local train line to enter the Yuzawa Nakazato car park. ルーデンス湯沢 about 5.5km Turn left onto Route 17 and go about 600m to the traffic lights at the 7-11 convenience store. Turn left at the traffic lights and continue for about 650m until you reach the traffic lights by the Save On convenience store. Turn right at these traffic lights and continue for 500m to the next traffic lights. Turn right at the traffic lights, cross the local train line and continue along the road past Yuzawa Fishing Park for about 2.5km. At the end t-junction, turn right and soon right again following the signposts to Ludens Yuzawa. かぐら（みつまた） about 8.5k Turn left onto Route 17 and continue on the road for about 8.5km to Mitsumata Ropeway. Mitsumata Ropeway Station car park is on the right hand side of Route 17. かぐら（田代） about 15km Turn left onto Route 17 and continue on the road for about 15km and through a few long tunnels to the Tashiro Ropeway Station. The car park is on the right hand side of Route 17. 苗場） about 22km Turn left onto Route 17 and continue on the road for about 22km until arriving in the Naeba area. The Naeba resort and car parks are on the right hand side of Route 17. 舞子スノーリゾート about 650m Go straight ahead at the exit and follow the road up to the main parking at the Maiko area of Maiko Snow Resort. 舞子スノーリゾート about 2.5k Turn left onto Prefecture Road 28 for just over 1km. 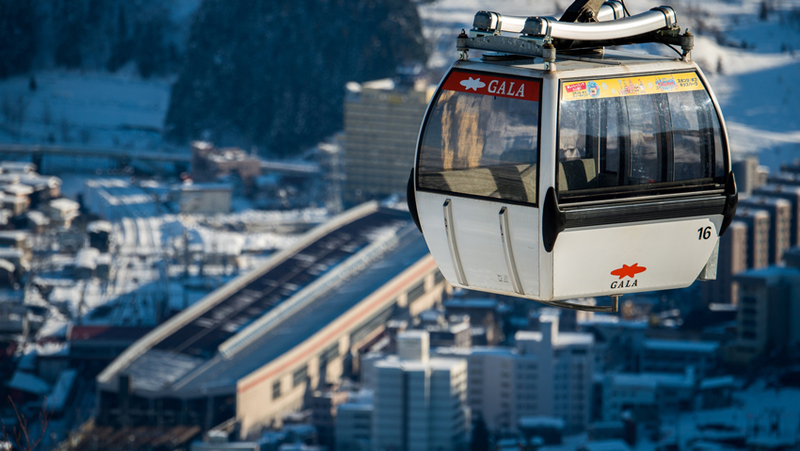 Turn right to head up to the Gondola station of Maiko Snow Resort. Mtグランビュー about 2.8km Turn right onto Prefecture Road 28 for about 1km until reaching the traffic lights on Route 17. Turn right onto Route 17 and turn left after about 700m, following the signs. 石打花岡 about 2.8km Turn right onto Prefecture Road 28 for about 1km until reaching the traffic lights on Route 17. Turn left onto Route 17 and 650m later turn right onto Route 353 towards Nozawa Onsen. After about 800m turn right and follow the signs to Ishiuchi Hanaoka. 石打丸山 about 3km Turn right onto Prefecture Road 28 for about 1km until reaching the traffic lights on Route 17. Turn left onto Route 17 and about 1km later turn right at the signposts for Ishiuchi Maruyama. The main car park is a few hundred metres further along that road on the left hand side. 石打丸山 about 4.5km* If you are heading towards the Hatsukaishi area of Ishiuchi Maruyama, Yuzawa IC is the closest exit on the Kanetsu Expressway. From Yuzawa IC, turn right onto Route 17 and continue towards Minamiuonuma for 4.5km. 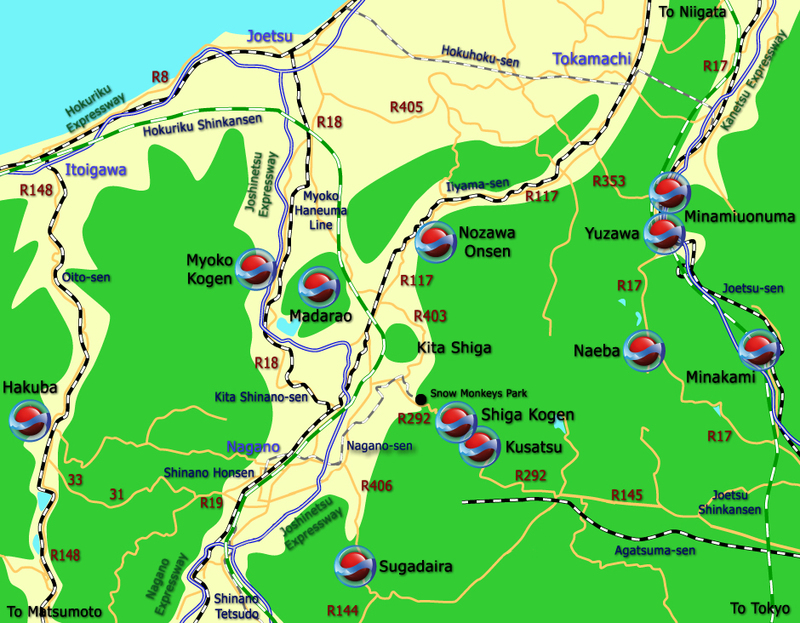 Hatsukaishi is just on the left off Route 17 with car parks on either side of the road. 上越国際 about 6km Turn right onto Prefecture Road 28 for about 1km until reaching the traffic lights on Route 17. Turn right onto Route 17 for about 4.5km until reaching a set of traffic lights with a large Joetsu Kokusai sign on the left hand side and a 7-11 on the far right side. Turn left at these traffic lights and go straight ahead for about 1km to arrive at the resort and car parks. シャトー塩沢 about 9.5km Turn right onto Prefecture Road 28 for about 1km until reaching the traffic lights on Route 17. Turn right onto Route 17 for about 6.5km. Turn left onto Prefecture Road 82 for about 1km, going under the Kanetsu Expressway road, and then turn left at the signposts to continue on up to the resort. 六日町スキーリゾート about 2.8km Turn right onto Route 253 and continue towards Tokamachi for about 2.5km. Turn left at the sign for the resort which is just on the left hand side. 六日町八海山 about 12.5km Turn left onto Route 253 for about 700m until reaching the traffic lights on Route 17. Turn left onto Route 17 heading towards Nagaoka for about 2.5km. Turn right into Prefecture Road 214 and follow the road straight on to the resort. Muikamachi Hakkaisan is about 9km from Route 17. SnowJapan Route Finder uses googlemaps to find routes to specific ski and snowboard resorts from other resorts, hotels and points in Japan. Routes are not pre-determined and SnowJapan has no control over any routes displayed. Take the Kanetsu Expressway south towards Tokyo from Yuzawa IC to Minakami IC, which is the next exit. The 11km+ Kanetsu Tunnel which goes under the Tanigawa mountain range is one of the longest in the world and the longest mountain road tunnel in Japan. Route 17 also goes from Yuzawa to the southern region of Minakami town via Kagura and Naeba, but it takes much longer than the expressway and is considerably further as well - very scenic though! Take Route 17 north towards Minamiuonuma and turn left onto Route 353 just past Ishiuchi Maruyama resort where Nozawa Onsen is clearly signposted. Continue on Route 353 for about 18km until reaching Route 117. Turn left onto Route 117 towards Nagano for about 31.5km, passing through Tsunan Town and Sakae Village until reaching the turn off for Nozawa Onsen. The village and ski resort are about 4km off Route 117. The resort car parks are clearly signposted on approaching the village. Take Route 17 north towards Minamiuonuma and turn left onto Route 353 just past Ishiuchi Maruyama resort (the signpost mentions Nozawa Onsen and Matsunoyama). Continue on Route 353 for about 18km until reaching Route 117. Turn left onto Route 117 towards Nagano for about 43.5km, passing through Tsunan Town and Sakae Village and past the turn off for Nozawa Onsen. There are a few different ways to get up to Madarao from Route 117 in Iiyama, but the main signpost is about 12km further on than the turn off for Nozawa. Turn right at the sign and then right again after about 450m. Cross over the train line and then turn left onto Prefecture Road 97. Follow this road and the signposts up to the Madarao area. Take Route 17 north towards Minamiuonuma and turn left onto Route 353 just past Ishiuchi Maruyama resort (the signpost mentions Nozawa Onsen and Matsunoyama). Continue on Route 353 for about 18km until reaching Route 117. Turn left onto Route 117 towards Nagano for 51km going through Tsunan Town, Sakae Village, past the turn off for Nozawa Onsen and through the main shopping area of Iiyama City until reaching the Toyota Iiyama IC of the Joshinetsu Expressway. Take the expressway north for about 20km and exit at Myoko Kogen IC. (Alternatively you can take the more scenic mountain route and go past Madarao Kogen and Tangram Ski Circus on Prefecture Road 97). Take Route 17 north towards Minamiuonuma and turn left onto Route 353 just past Ishiuchi Maruyama resort (the signpost mentions Nozawa Onsen and Matsunoyama). Continue on Route 353 for about 18km until reaching Route 117. Turn left onto Route 117 towards Nagano for about 47km going through Tsunan Town, Sakae Village, past the turn off for Nozawa Onsen and through the main shopping area of Iiyama City until reaching the sign to turn left for Nagano and Nakano. Turn left here and follow Route 292 and the signposts up to the Shiga Kogen area. Take Route 17 north towards Minamiuonuma and turn left onto Route 353 just past Ishiuchi Maruyama resort (the signpost mentions Nozawa Onsen and Matsunoyama). Continue on Route 353 for about 18km until reaching Route 117. Turn left onto Route 117 towards Nagano for about 47km going through Tsunan Town, Sakae Village, past the turn off for Nozawa Onsen and through the main shopping area of Iiyama City until reaching the sign to turn left for Nagano and Nakano. Follow the signs and Route 18 into Nagano City. Alternatively, take the Joshinetsu expressway south from Toyota Iiyama IC to either the Suzuka Nagano Higashi IC or Nagano IC. Take Route 17 north towards Minamiuonuma and turn left onto Route 353 just past Ishiuchi Maruyama resort (the signpost mentions Nozawa Onsen and Matsunoyama). Continue on Route 353 for about 18km until you reach Route 117. Turn left onto Route 117 towards Nagano for about 51km going through Tsunan Town, Sakae Village, past the turn off for Nozawa Onsen and through the main shopping area of Iiyama City until reaching the Toyota Iiyama IC of the Joshinetsu Expressway. Take the expressway south for 20km to the Suzuka Nagano Higashi IC. At the Suzaka Nagano Higashi IC exit, turn right onto Route 403 for less than 1km and then turn right onto Prefecture Road 58 where Sugadaira is signposted. Follow that road for about 6km until arriving at some traffic lights on Route 406. Turn right onto Route 406 and head up to Sugadaira. Take Route 17 north towards Minamiuonuma and turn left onto Route 353 just past Ishiuchi Maruyama resort (the signpost mentions Nozawa Onsen and Matsunoyama). Continue on Route 353 for about 18km until you reach Route 117. Turn left onto Route 117 towards Nagano for about 51km going through Tsunan Town, Sakae Village, past the turn off for Nozawa Onsen and through the main shopping area of Iiyama City until reaching the Toyota Iiyama IC of the Joshinetsu Expressway. Take the expressway south for about 30km Nagano IC. At the Nagano IC exit, turn right onto Prefecture Road 35 for just under 3.5km and head towards central Nagano City. At the Route 19 (Nagano Minami Bypass) junction, turn left - Hakuba is signposted from this point. After about 13.5km on Route 19 turn right onto the Hakuba Nagano Toll Road (210 yen) and from there Prefecture Roads 31 and 33 continue straight into Hakuba. For detailed information on how to get to Yuzawa and Minamiuonuma by train and public transport, please go to this section.